You won't see it or hear it. Seamlessly integrate your Bosch dishwasher into your kitchen by matching it to your kitchen's custom cabinetry. The unique design allows for a fully flush install for a new level of sophistication. These dishwashers are so quiet, we've added a light to let you know a cycle is running. Models with a flexible third rack provide extra room for ramekins, measuring cups and extra-large utensils while adjustable tines lower to fit awkward, bulky items. 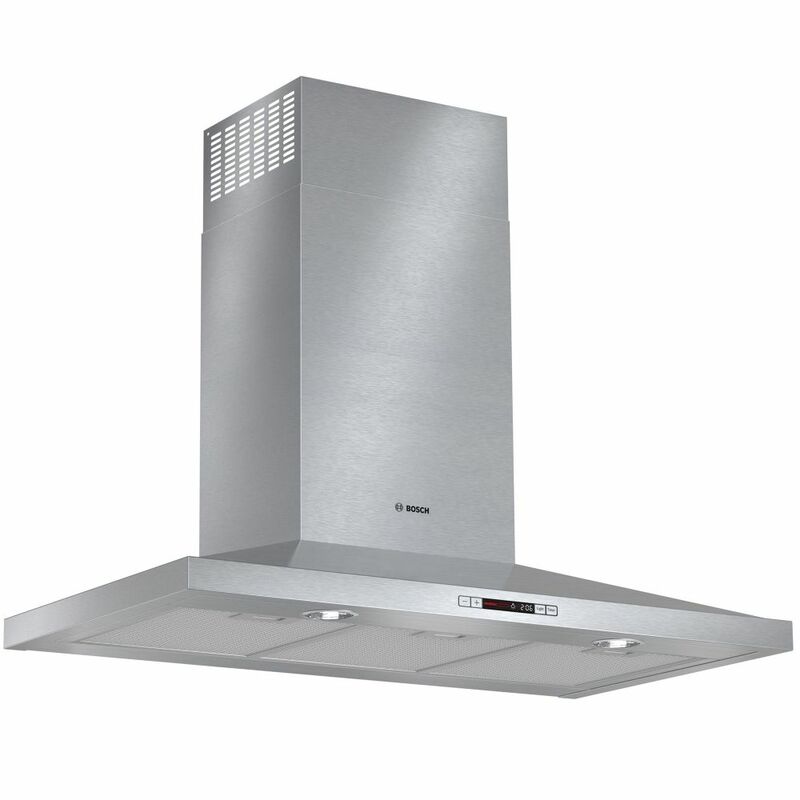 300 Series - 36 inch Pyramid Canopy Chimney Hood - 600 CFM Sleek, European design that blends with any kitchen. Bosch stainless steel chimney hoods integrate matching user interfaces and design aesthetics to complete the Bosch kitchen suite with sleek and sophisticated styling reminiscent of European design. With 300 and 600 CFM options, beautiful Bosch hoods will quickly clear the air of grease, steam, smoke and odour to keep your home fresh and odour free. 300 Series - 36 inch Pyramid Canopy Chimney Hood - 600 CFM is rated 3.3 out of 5 by 3. Rated 1 out of 5 by Jl from All show and no go We purchased this vent hood to go with a kitchen remodel full of Bosch appliances. From day one it has never done a sufficient job of venting smoke and steam from the cooktop. The suction is so weak that you can take a Kleenex and hold it against the metal grill and it won't stay. Even on high, where it's extremely loud, you're not going to get smoke out. This thing has become a conversation piece at dinner party's, which we have all the time. We have to bring a box fan in from the garage and open up a window while we're cooking and all of our friends think it's hilarious considering the high-end nature of our remodel and we have this piece of junk that almost ruins the night. Rated 4 out of 5 by sbabcock61 from Sylish but very loud Bought this in April, 2018 Couple of things : 1. The lighting should be LED instead of the very hot halogen - will be looking to replace these space heaters with LED compatible lights as soon as possible 2. The lowest setting of the blower / fan is very noisy. Would have thought that at this price point I'd be able to have a conversation while having it set on low. Settings 2 - 4 are impossible loud. 3. Installation instructions are pathetic to say the least. Rated 5 out of 5 by SuzanneB from Cherry on my sundae! We renovated our kitchen in December 2017 and I finally have all the bells and whistles I've ever wanted! My Bosch Canopy Chimney gives our kitchen the high end finish look we were hoping for! It's the cherry on my sundae! I am very happy, and I highly recommend all Bosch appliances to anyone out there considering a major new purchase!